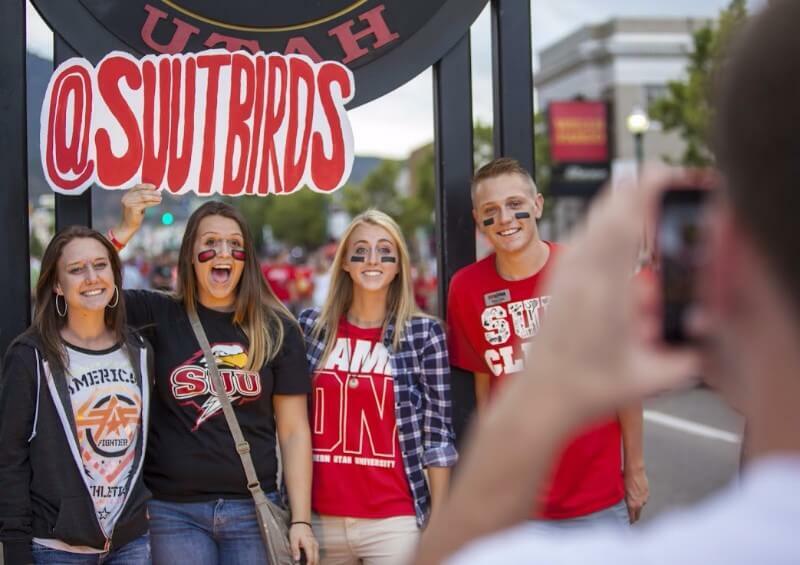 Up until 2015, enrollment at Southern Utah University (SUU) was turbulent. For the previous seven years, numbers had been inconsistent and falling, and applications were weak. “We generated applications, but felt that they weren’t good quality. Of all the applications, only 20 percent enrolled,” said Ellen Treanor, assistant vice president, brand strategy. SUU was looking for data-informed solutions that would mobilize the entire campus around enrollment management efforts. 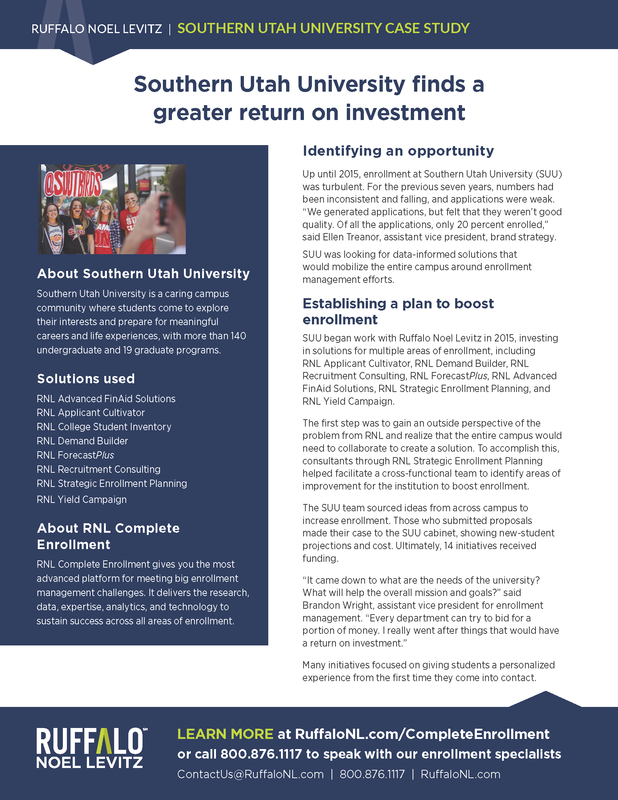 SUU began work with Ruffalo Noel Levitz in 2015, investing in solutions for multiple areas of enrollment, including RNL Applicant Cultivator, RNL Demand Builder, RNL Recruitment Consulting, RNL ForecastPlus, RNL Advanced FinAid Solutions, RNL Strategic Enrollment Planning, and RNL Yield Campaign. The first step was to gain an outside perspective of the problem from RNL and realize that the entire campus would need to collaborate to create a solution. To accomplish this, consultants through RNL Strategic Enrollment Planning helped facilitate a cross-functional team to identify areas of improvement for the institution to boost enrollment. The SUU team sourced ideas from across campus to increase enrollment. Those who submitted proposals made their case to the SUU cabinet, showing new-student projections and cost. Ultimately, 14 initiatives received funding. Many initiatives focused on giving students a personalized experience from the first time they come into contact. Campus tours personalized to match student goals, including a personalized financial aid appointment. Last year, SUU provided 500more campus tours than in the previous year. Having meaningful phone conversations with prospective students to see why they were or weren’t attending SUU. Student feedback helped SUU refine and polish admissions and recruitment communications to reflect what students were saying. Custom advising support, followed up with a class schedule suited to the student’s wants and needs. This provides extra support for first-generation students and helps all students stay on track without getting discouraged. Pursuing out-of-state recruitment to reach a wider audience of prospective students. A 40 percent increase in total freshman applications from 2015 to 2017, including an increase of 49 percent in-state and 13 percent out-of-state. A 22 percent increase in new freshman enrollment from 2015 to 2017, including an increase of 27 percent in-state and 9 percent out-of-state. Maintained small class size and low student-faculty ratio, as well as grade point average and ACT scores for incoming freshmen. A 14 percent increase in new freshman deposits over last year (2017), including an increase of 12 percent in-state and 20 percent out-of-state. SUU aims to build on the energetic growth and vitality on campus and continue finding new ways to connect with students. “RNL helped us look at enrollment management holistically. Not just more students, but the right kind of students,” said Stuart Jones, vice president for advancement and enrollment management. The university continues to prioritize student experience and customer service as a way to get students in the door to stay.